The 35 km of trunk sewers and tunnels extend to the Riverview/Moncton causeway, around the traffic circle and all the way to Dover Road on the Moncton north side of the Petitcodiac River. On the Riverview side, it extends from the causeway to Mill Creek. The culminating achievement of this collector network is the 1,100 m-long tunnel under the riverbed from Bore Park in Moncton to the Main Pumping Station in Riverview. It is a 1.6 m in diameter (5.5 ft) tunnel and is 22 m (72 ft) below the ground surface. Prior to 1983, all the major trunk sewers as well as other localized street sewers discharged along the Petitcodiac River, Halls Creek and Jonathan Creek. 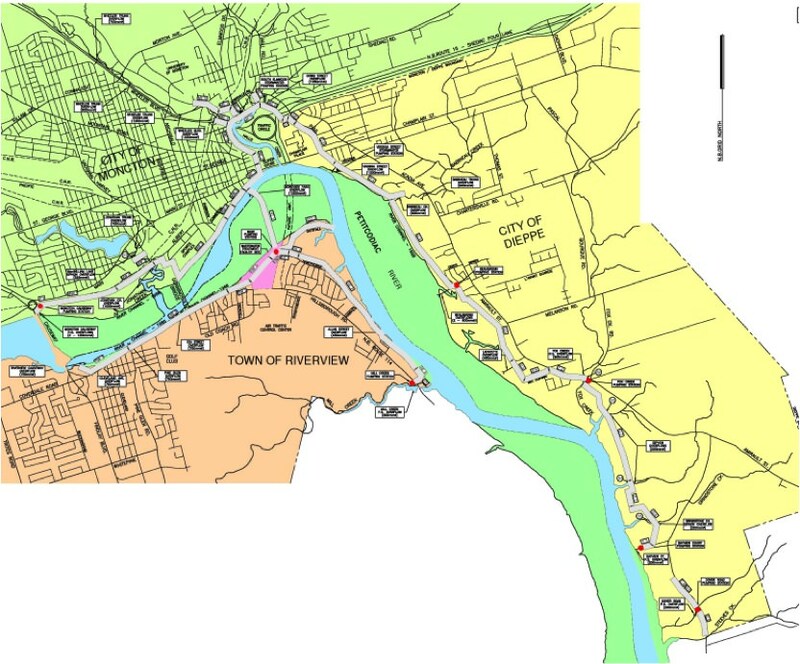 Close to 80 outfalls were connected to the 35 Km long GMWC collector Sewer System which extends from Dover Rd around the Halls Creek Traffic Circle to the Causeway on the Moncton side and from Mill Creek to the Causeway on the Riverview side. There are eight (8) remote pumping stations along the collector sewer system. One medium sized pumping station is located at the Causeway on the Moncton side that pumps wastewater from the Industrial park and West Main Street. Four smaller sized pumping stations are located along the Dieppe Collector Sewer at Beaubassin, Fox Creek, Dover Road and Bayview Court. There is one small pumping station on the east Riverview collector at Mill Creek. The Virginia Street Pumping Station in Dieppe and the South Elmwood Drive Pumping Station in Moncton are dedicated to protecting low lying drainage basins from flooding during wet weather events. All wastewater from Riverview enter a chamber on the north side of the Main Sewage Pumping Station and enters the wet well reservoir at an elevation – 1.0 m.